When we think of ancient Greek science, we tend to imagine Raphael’s great fresco “The School of Athens” featuring philosophers in togas lost in thought. The picture suggests that science in the ancient world was a single school of thought, much like modern science purports to be. But as the great Thony Christie pointed out on his blog a few months ago, there was no such monolithic science in the ancient world. Instead, there were all sorts of different sciences spread across the Mediterranean during the thousand odd years that separate the pre-Socratics from John Philoponus. We also tend to think of the story of science being a single thread that begins with the pre-Socratics and wends its way down through time via Athens, Alexandria, Baghdad, Florence, Oxford and Harvard. I’ve just finished The Forgotten Revolution: HowScience Was Born in 300 BC and Why it Had to Be Reborn by Lucio Russo and translated into English by Silvio Levy (Springer, 2004) which takes this trope a great deal further than it can realistically go. Russo imagines something very like modern science arose in the Hellenistic era around 250BC. Rather stupidly, the Romans forgot all about it. For Russo, the scientific revolution was simply the rediscovery of the Greek science that had been lost. Unfortunately, although there were lots of different Greek sciences, none of them looked much like modern science. In fact, judged by the standards of modern science (which is, of course, a completely anachronistic thing to do), most Greek natural philosophy is wrong, as is Greek medicine. It is only in mathematics that many achievements of the Greeks are still part of the body of knowledge. Finally, we imagine the Greeks, as a people, being particularly interested in science. However, science was the preoccupation of a small number of thinkers at the highest echelons of society in a few of the largest cities. It was practiced by a minority of a minority of a minority of the population. Papyri unearthed in Egypt show us just what an unusual pursuit it was. You can play around with the Mertens Pack papyrus database online to see this first hand. Homer features in 1,708 papyri on the database, Menander in 121, and Thucydides in 101. By contrast, Euclid and Ptolemy appear six times each (but only really in schoolbook editions of their ideas), while of Aristotle’s 15 appearances, only two are from his works of natural philosophy. 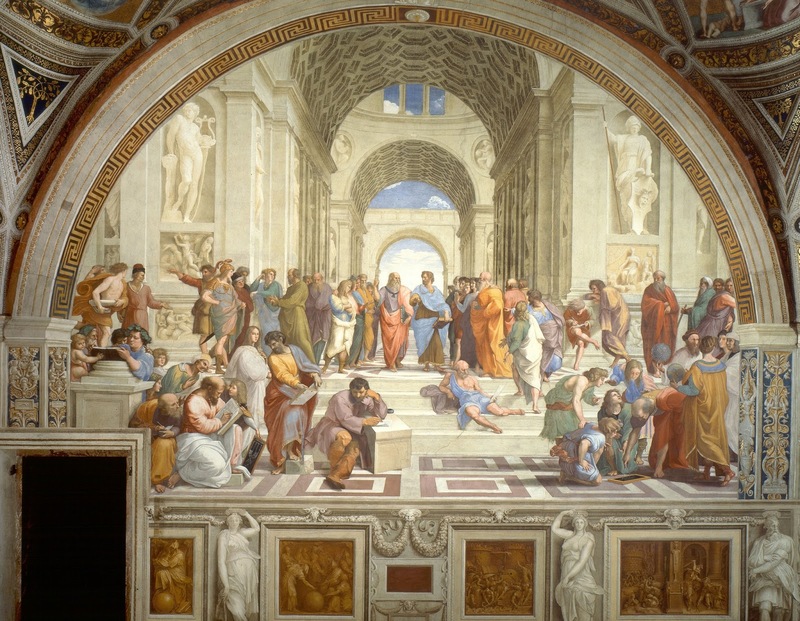 Our impression that science and mathematics were subjects of widespread interest among the Greeks is caused by the bias of later Christian and Muslim copyists in preserving scientific texts, rather than the proclivities of the pagan Greeks themselves. In summary, the popular picture of Greek science is wrong in almost all respects. And there’s one final point about which many people are mistaken. It’s widely assumed that the rise of Christianity put a stop to Greek science. This is surprising, because the vast majority of surviving ancient Greek science and medicine dates from the second century AD onwards. While it was once common to declare late Greek science as derivative and (frankly) boring, more recent studies of the work of John Philoponus mean that view can no longer be maintained. It is also being realised that the versions of Euclid and Ptolemy that we possess today are the product of careful philological and editorial work in the fourth and fifth centuries AD. In other words, Greeks of the Christian era were not just handing down the masterworks of previous eras, they were amending and improving them. That said, Christians did have a different set of interests to pagans so they used Greek philosophy for their own purposes rather than simply carrying forward a pagan agenda. In The Forgotten Revolution, Russo blames the Roman annexation of Greece and Egypt for a decline in scientific knowledge. For the Romans, science was of little interest. They enjoyed Greek literature and art, but scientific works were not something any upwardly mobile Roman would be interested in patronising. Russo may have a point here. Nonetheless, his central contention that the work of Copernicus and Galileo was anticipated in the Hellenistic era is a great deal more dubious. As far as he is concerned, all the good bits in late Greek natural philosophy come from lost Hellenistic sources. All this means I can't really recommend his book. It's a case of "I've read it so you don't have to". Some nonreligious friends of mine were recently texting me and each other about the recent terrorist attacks in Paris and how the specific religion of the terrorists was irrelevant. I loathe texting because my responses are always too long for that format; by the time I type something in, the conversation has shifted, so it is no longer clear what I am responding to. Regardless, my friends brought up alleged terrorist attacks by Christians to suggest that all groups, or at least all religious groups, are equally prone to terrorism, none more so than any other. They suggested several unconvincing cases, but I think the best recent example of this would be Anders Breivik, the Norwegian who killed 70 teenagers at a summer camp, and who described himself as Christian. However, he also stated explicitly that he was not a religious person, had only tried praying once in his life, and wanted to establish a secular society, not a theological one. "Christian" for him meant "traditional": he wanted to fight multiculturalism and re-embrace the traditional cultures of Norway and Europe in general, and historically Christianity was a strong presence in those cultures (the fact that these cultures shunned murder and terrorism seems to have escaped him). He stated that it was possible to be a "Christian-atheist", that is, an atheist who wants to preserve the traditional European culture and legacy but who does not believe in God or Jesus and does not accept what we usually think of as Christianity. Of course you could find horrific acts done in the name of Christianity throughout history; for that matter, you could find horrific acts done in the name of any ideology -- religious, atheistic, political -- as long as it has a sufficient number of members. This, I assume, is what my friends were referring to when they said (texted) that people use ideology for an excuse to commit evil acts, and we shouldn't blame the ideology in question. They were really only saying that we shouldn't blame Islam for Islamic terrorism and seemed to be suggesting that we could blame Christianity for the alleged examples of Christian terrorism, but really they were just illustrating how people were employing a double-standard in blaming Islam for the evil committed in its name but excusing Christianity for the evil committed in its name. I'm afraid I don't think it's that simple. As I've written before, ideas have consequences and different ideas have different consequences. There will always be people who will find some excuse to commit evil regardless of their ideology, but to suggest that therefore no ideology is more prone to violence than any other is absurd. A pacifistic ideology is less likely to lead to violence than an ideology that advocates war and human sacrifice. Moreover, the idea that religious ideologies are uniquely prone to violence (and all equally so) is simply indefensible. You can use the same categories we just used: a pacifistic religion is less likely to lead to violence than a religion that advocates war and human sacrifice. This seems painfully obvious to me, yet much of discussion on this subject only makes sense if we presuppose the absurdity that all religions, by their very nature, are inherently, and equally, violent. My friends pointed to the recent case of a guy who shot up an abortion clinic. His family said he was Christian but also that he was mentally ill. To blame his acts on Christianity instead of his mental illness seems needlessly inimical. Nevertheless, my friends' point was that he opposed abortion because of his Christian beliefs, and this is what motivated him to commit his evil act. So there's a simple move from his Christian belief to his act of murder. The problem with this is that you could blame virtually any disagreement for violence this way. If a person thinks that his belief B is true and important and kills another person for disagreeing with him, it was belief in B that led the first person to the violence. Except it wasn't: you have to add another belief to the mix -- namely that it is acceptable and perhaps laudatory to defend or enforce true important beliefs, or at least some of them, by committing violence against those who don't hold them -- and it is this other belief, call it O, that provides the motive for the violence. We can make it more subtle by asking whether a person has a belief that entails O, implies O, or perhaps is just compatible with O. Now here's the point: some ideologies have these "other" beliefs, beliefs like O or those that lead to them, and some don't. It is perfectly reasonable to ask of a particular ideology whether it contains beliefs like this or whether it doesn't. And you're going to get different answers from different ideologies and in particular from different religious ideologies. You just have to take it on a case-by-case basis. It is not hatred, it is not phobic, to ask this. You can ask this of Christianity, you can ask this of Islam, you can ask this of atheism, of democracy, of Marxism, etc. To suggest that no ideologies contain beliefs like O or beliefs that lead to O is silly and false: of course some do. To suggest that all ideologies contain beliefs like O is also silly and false. To suggest that all ideologies of a particular type (religious or political ideologies, say) contain beliefs like O would require one to demonstrate the connection between this particular type and O -- and in the case of religious and political ideologies, such a demonstration is not forthcoming: some do, some don't. Just because some religious ideologies contain beliefs like O. It doesn't follow from this they all do. This is just sloppy thinking. The two ideologies we're really dealing with here are Christianity and Islam. So does Christianity contain a belief or doctrine like O or that can be reasonably interpreted as leading to or implying O? I'm sure I'm biased here, but I don't think it does, and in fact I think Christianity contains beliefs and doctrines that preclude O. I'm thinking here of claims such as that all human beings are created in God's image, and so all are of infinite and equal value. That the law can be summed up by two commandments: love God and love other people. That it is impossible to love God while hating someone, since the hated person is created in God's image. That God is love itself, and that he loves each individual so much that he became a human being and willingly experienced the very worst humanity had to offer -- and in so doing reconciled us to him. That all people, regardless of their ethnicity, gender, or social standing are of equal value to God because God loves them equally, including those who hate him. So human value is determined by the fact that we are created in God's image and that God loves us. These are not arbitrary passages, they are central doctrines, universally accepted throughout Christian history. To reject them is to reject Christianity. Of course there will be some people who do reject them while insisting nevertheless that they are Christians (think of the Westboro Baptist church). But any large ideology will have people who are only in it nominally, using it somehow as a mask to cover whatever terrible things they want to say and do. Having said that, it's not my place to say whether someone has truly accepted Christ in their hearts: human beings are very complex, and we have an incredible and disturbing ability to deceive ourselves. My point is rather that Christianity does not contain any beliefs like O or that imply or entail O, and in fact it contains beliefs -- central doctrines even -- that are incompatible with beliefs like O. By saying this I don't mean to imply that the only valid form of Christianity is pacifistic. Certainly some do interpret it that way, but it has usually been understood to leave room for self-defense, warfare, and often capital punishment. Whether the claim that all human beings are created in God's image and that God loves everyone, thus imbuing every person with infinite and equal value is incompatible with warfare and capital punishment is certainly debatable -- I even know Christians who think it is incompatible with self-defense, and that they are morally obligated to not defend themselves or their loved ones if they are attacked, which I think is insane and morally reprehensible. But that's not the question: the question is whether warfare and capital punishment are equivalent to O, the belief that it is acceptable and perhaps laudatory to defend or enforce true important beliefs by committing violence against those who don't hold them. But neither warfare nor capital punishment -- assuming the debatable point that they are compatible with the central Christian doctrines above -- meet this definition (and obviously neither does self-defense). Regardless of whether one agrees with the proffered rationales behind war and capital punishment, they are not the same as O. You can be opposed to warfare in all cases without thinking it's always undertaken in order to visit violence on those with whom you disagree -- another Christian doctrine is just war theory, according to which war has to meet certain moral conditions in order for it to be appropriate. You can be opposed to capital punishment without thinking that the only reason for it is to visit violence on those with whom you disagree. This is sufficient to demonstrate that warfare and capital punishment are not equivalent to O, regardless of whatever else we think of them. A critic might make the counterargument that the central doctrines I've mentioned are contradicted by some Bible passages. God loves all people equally? But he says he hated Esau. God commands us to love others? But Jesus says we have to hate our own families in order to be his disciple. The problem with this is that the central doctrines have always been understand as the definitive claims, so that these "problem passages" have to be explained in light of the much more prevalent passages that support the doctrines. Whether or not the explanations work is not my point; I'm just saying that these passages were not seen historically as contradicting the central doctrines, and it is the central doctrines that are relevant as to whether Christianity is compatible with O. Certainly, some people have taken these problem passages individually and superficially, using them as a justification for evil. But this can only be done by ignoring the larger context of the Bible as a whole, since this larger context includes the central doctrines which are incompatible with interpreting these passages as equivalent to O. Again, this is not just my interpretation: these central doctrines are universally accepted throughout Christian history. It's not just my reading, my understanding of what the Bible says, it's what Christianity teaches and has always taught. The critic might press the point by pointing to events described in the Bible where God seems to sanction violence, and excessive violence at that. The usual suspect here is the conquest of Canaan in the book of Joshua, when God told the Israelites to conquer a land militarily, often with the addition of leaving no one alive, including children. This has been a huge source of discussion throughout Christian history precisely because it is enormously difficult to reconcile with the doctrines mentioned above, and others. However, regardless of how we reconcile it (assuming it can be), the history of Christian and Jewish thought testifies that the rationale behind this series of events was believed to be unique to that particular time and place, applying only to those specific circumstances, and was not a model for future acts. It was not understood as a paradigm for the Jew or Christian, or the Jewish or Christian nation, to follow. Again, my goal here is not to provide some explanation for whether the conquest of Canaan can be made consistent with the doctrines that God is love, loves everyone equally, etc. My point is just that the violence involved in the conquest of Canaan does not, and has never been understood to, illustrate central doctrines. The central doctrines are those mentioned above and which preclude beliefs like O. What about Islam? The Hadith say that God created Adam in his image, and some Islamic thinkers and mystics have repeated this point. However, they don't seem to understand it the same way that Jews and Christians do: a primary claim of Islam, a "central doctrine", is that there can be no representation of God, no "image" of him. Any attempted portrayal of God would inevitably distort him and so be blasphemous. Some Muslims (not all, despite belief to the contrary) extend this act of reverence to depictions of Muhammad and other prophets by not drawing or painting their faces, or by scratching out the faces painted by other Muslims. But if there can be no representation of God, then human beings cannot really be representations of him by being created in his image. To think they are is heretical. Moreover, the Judeo-Christian doctrine of imago Dei involves the claim that God creates human beings so that they have certain properties that God has in a higher or purer fashion. We have a sense of rationality, a sense of morality, and a sense of beauty because God is the ground of rationality, morality, and beauty. They are rooted in his very nature. These are points of contact between God and humanity. But another central doctrine of Islam is that God is completely transcendent, and that therefore there can be no point of contact between God and humanity. Even Muhammad didn't receive the Qur'an from God, he received it from the archangel Gabriel who had received it from God. There are important qualifications to this: for example, the Qur'an states that God is closer to us than we are to our own jugular veins. But I don't think this negates the point that there is no direct connection between God and humanity in Islam. Another point: the Judeo-Christian points of contact between God and humanity are traits we have that are aspects of God's nature (rationality, morality). But in Islam God has no nature: if he had a nature then he couldn't do something contrary to it (otherwise it wouldn't be his nature), and this is to limit God's omnipotence. Some Christians think this too, and in fact some Muslims deny it and affirm that God does have a nature: I think the Mu'tazilite school did so. But denying that God has a nature is a minority view in Christianity, and the almost universal view in Islam. OK, so Islam denies that human beings are created in God's image in the Judeo-Christian sense, which is what forms the basis of affirming that all human beings are of infinite and equal value. God has ultimate value, he is the source of all value, so being created in his image we have derivative value. But this doesn't mean that Islam denies that all human beings have value: maybe they have a different basis for affirming it. In fact, above, I gave a second reason Christianity affirms it: God loves us all equally, including those who hate him and are in a state of rebellion against him. Perhaps Islam states something like this, thus providing them a basis for affirming that human beings are of equal value, which would therefore seem to be incompatible with beliefs like O. Unfortunately, this turns out to not be the case. Throughout the Qur'an, God is quoted as saying that he does not love an awful lot of people -- specifically non-Muslims. The only people he loves are Muslims. And this forms the basis for human value in Islam. The better a Muslim you are, the more human you are. If you're not a Muslim at all, you're screwed. Now does this entail or imply O, that one is justified in committing violence against those who do not agree with you? Actually, I don't think it does: just thinking other people aren't as fully human as you are does not say anything about violence. Once again, you'd have to import O into the system, a belief that does entail violence. However, I do think that this view of human value is compatible with O. This view of human value does not, in itself, give one a reason to commit violence. But it doesn't give one a reason to not commit violence either. It may not push one towards O, but there is nothing in it to ward it off if one has some other motive to accept O. So the next question is whether Islam provides another motive. We saw above that there are some Bible passages which could be interpreted as advocating violence if taken superficially and out of their larger context where they are outnumbered by passages stating the opposite. The Qur'an seems to be differently proportioned along these lines: passages which advocate violence heavily outnumber those which advocate peace. Of course, on the one hand, it's not just a matter of counting passages, but of central doctrines. On the other hand, central doctrines are usually central because of the scriptural evidence behind them. Perhaps Islam only allows violence in the case of warfare or capital punishment -- although I note that Islam has no just war doctrine, so the criteria that prevent warfare from being equivalent to O in Christianity are not evident in Islam. Perhaps, again, they have other criteria to avoid this equivalence. However, at this point, I'm going to pass the buck to the Muslim world to tell us, both historically and contemporarily, how they have understood these passages, and what Islam's central doctrines are. I'm not asking for minority views but for the majority view, at least among Muslim theologians and philosophers. Jim S here. Sorry for being out of the blogging business for so long, I got kind of burned out by the comments in this post, although it was probably just the straw that broke the camel's back. I haven't been putting much up on Agent Intellect either. It's not like I'm not writing, I have a book and an article coming out, I just haven't been blogging. Anyway, I'm writing a post that I'll put up in a couple days or so in order to see if I can force myself out of this slump and back into the thick of things. I'm not sure if the post will be any good, I'm just trying to kickstart something.